Putting them together requires that we return to principle number two, rotation of the body around the mid-line. If you think about it (and at this early stage, it’s probably best to do as little of that as possible) there is a single equation underpinning everything you do. To strike your opponent, you need to set up at the optimal distance so that when you rotate your body, you extend your limb to its maximum to deliver the most powerful, most accurate strike. Technique and footwork are entirely in the service of this. In Muay Thai, punches don’t score. Punches are a means to transition from long distance (kicking) to short distance (elbows, knees, and grappling). Traditionally, Thai boxers used punches to traverse the dangerous middle distance between the two. The Dutch contribution to fight sports is that they configured their style around a boxing framework. 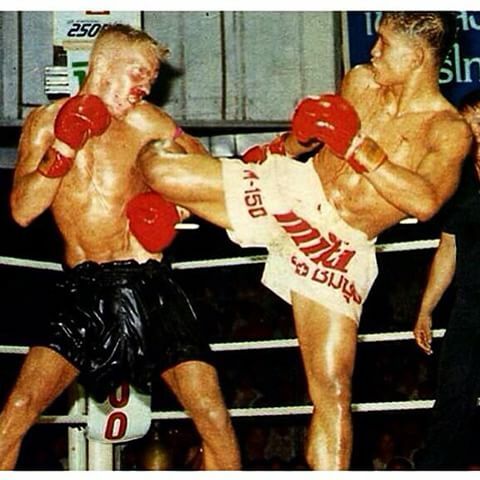 Ramon Dekkers and Rob Kaman were the progenitors of this approach and defeated many of their Thai opponents by knockout by punches, which was the surest way to secure a victory fighting in their opponent’s backyard. The other thing about boxing is that it is circular, rather than the linear ‘walk up and attack’ common amongst traditional martial arts. Circular movement shifts you away from your opponent’s weapons while simultaneously creating openings, all the while ensuring that you remain in range. It may sound like a small thing, but it changed the sport of Muay Thai forever. If you’re pursuing the Dutch style, it’s hands first, legs after. The hands create the opening for the legs by keeping the opponent busy and off balance. Simply put, you can rotate from right to left or left to right. This single rotation is the basis of every attack. You can add a rotation to add a technique, but it’s more or less always the same, very simple thing. Cross, followed by a low roundhouse kick. Techniques can be added by adding a rotation, but you’re essentially working some variation of these two basic combinations. Next ArticleDo Combat Sports Promote Violence or Teach Respect?